Fm wireless transmitter circuit, the truth is one kind microphone that developed to be used without a cable from the microphone to the amplifier. Microphone cable as much Because microphone cable is high quality that has relatively high prices. Microphone will receive the audio signal is mixed with range FM frequency to transmit the broadcast spectrum. The audio input is just bring to the FM radio receiver tuned provide the radio only. This circuit has very little equipment, MIC is used in the circuit be special that called the condenser microphone. Radio frequency generator and the audio mixer on the Radio frequency is generated. 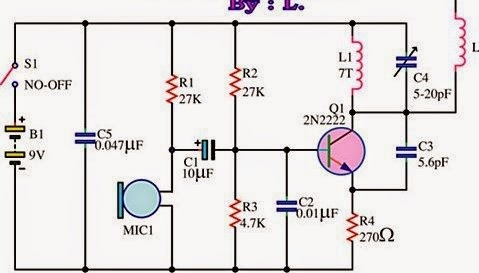 0 Response to "WIRELESS FM TRANSMITTER CIRCUIT "